Google unveiled its smart home speaker called Google Home at its Made by Google event on October 4. The speaker, like the Google Pixel smartphones, is powered by the Google Assistant. At the time of launch, Google Home did not have many integrations to work with, but that should change when the Assistant SDK becomes available. Now however, IFTTT has rolled out the Google Assistant channel, bringing hundreds of new products and services the voice-based virtual assistant can interact with, be it from Google Home or a Pixel smartphone. Users can now create ‘recipes’ to IFTTT to connect Google Assistant with a number of products and services, like Facebook, Philips Hue etc. IFTTT is a web automation service that works on the principle of If This, Then That – a fancy name for the simple If-Then loops used in algorithms that anyone with basic programming knowledge would understand. If a certain condition is met, a certain action will be carried out. These are also called recipes. It connects to a number of other Internet services as well as apps (via the IF apps for Android and iOS) like Gmail, Facebook, Instagram etc. to allow users to form some chains of simple commands. It then operates the first command if the condition is met as per the instructions given by the user. The company touts integrations with as many as 376 services. To add IFTTT integration to their Pixel smartphone or Google Home speaker, users will need to go to www.ifttt.com/google_assistant and connect their associated Google account. 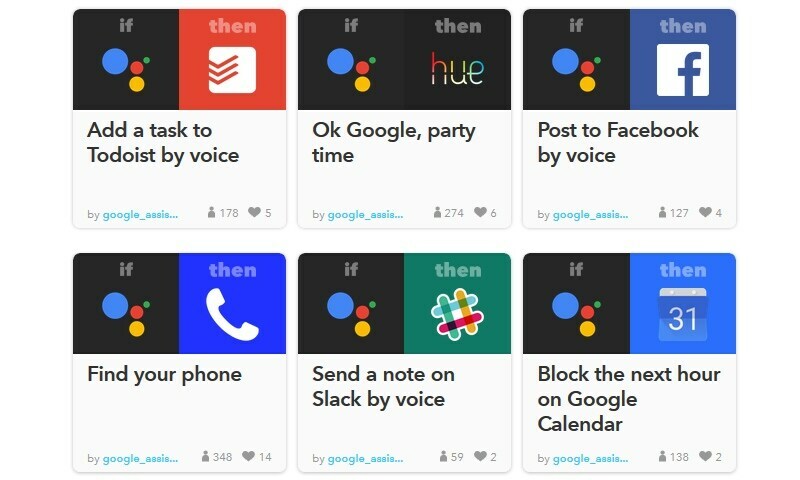 IFTTT has detailed some of the recipes that will be supported by Google Assistant – you can add a task to Todoist by your voice, ask Philips to change the lighting of the room, post to Facebook and Twitter through your voice, send a Slack message, or add a contact on Google. A very crucial feature to locate your smartphone is also supported by IFTTT. You can read the entire set of commands on IFTTT’s website. To recall, Google Home is still in infancy with only a few partners like Philips Hue and Samsung SmartThings to allow users to seamlessly use their voice for multiple actions. Google Home is slated to go on sale in upcoming weeks.